What times do your tours leave and how long does it take? MIDDLE YOUGH – You can reserve a tour for 11:00 check-in time. Tours last anywhere from 4 – 6 hours. Keep in mind we do not have all three times everyday, so it is best to call our office at 1-800-4 RAFTIN to check availability. LOWER YOUGH – You can reserve a tour for 9:00, 11:00, 1:00, or 3:00 check-in time. Tours last anywhere from 3 – 6 hours depending on the format. Keep in mind we do not have all times everyday, so it is best to call our office at 1-800-4 RAFTIN to check availability. UPPER YOUGH – You can reserve a tour for 12:00 check-in time in June, July, or August, or 11:00 check-in time in April, May, September or October. Tours last anywhere from 6 – 8 hours. The Upper Yough does not run every day, so it is best to call our office at 1-800-4 RAFTIN to check availability. CHEAT CANYON – You can reserve a tour for 10:00 check-in time. Tours last anywhere from 4 – 6 hours. 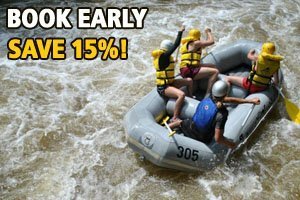 The Cheat Canyon only runs through May, so it is best to call our office at 1-800-4 RAFTIN to check availability. ← Can I request my guide?